In the opening moments of the latest sun-drenched melodrama from director Lasse Hallström (Chocolat, Hachi: A Dog's Tale) a dog is born and just quickly a dog is euthanized. It's a strange way to open a PG-rated family film about man's best friend, but was apparently the best way to set the stage for a film whose premise is that of dog reincarnation as narrated by Olaf from Frozen. Sound strange? It is, a little bit, but not nearly as bad as you might think though not nearly as effective as it should be either. This is taking into considering the fact the writers/producers and Hallström don't shy away from exploiting what is arguably the easiest way to elicit tears from your audience-a dog dying. They do this at least four times. And yet, through each of these segments, each of these lives that we see different breeds and genders of dogs lead (all voiced by Josh Gad) there is never that moment that just breaks you in the way you expect a movie like this to do. 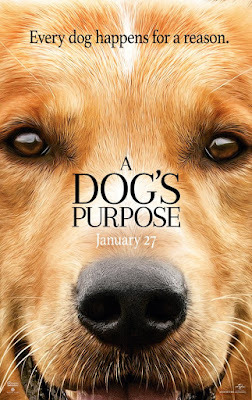 It seems there was no hesitation in doing what it takes to get the audience to that point, but the execution never matches the intention thus making A Dog's Purpose more of a sleeper than the quickly euthanized pup we met in the first scene. Of course, Universal knows what it's doing and who the audience is for this type of movie and up until a few weeks ago were no doubt counting on cashing in on the countless dog lovers that flood this great land of ours. It's possible, but is now rather difficult to watch the film without the experience being at least somewhat tainted by the set footage that was released in which a trainer is forced to place a dog in water the canine clearly doesn't care to get in for the sake of a shot. Does the footage strike concern for how movies such as A Dog's Purpose are made? Potentially, sure. Is a bigger deal being made out of what footage we've seen than necessary? Absolutely. Sure, the dog clearly doesn't care to go in the water, but the trainer seemed especially sensitive to this hesitation and we only know if we don't like something by trying it first and that could just as easily be the other side of the coin in this case. I stayed through the credits to see that the film received its seal of approval from the American Humane Society and indeed it did. That's enough for me to trust that what video has been released was likely largely taken out of context if not a massive PR stunt to get more people talking about the movie. Needless to say, dog lovers will likely still flock to A Dog's Purpose and have no reason not to-it's made especially for them anyway. Once we get past the more troubling than the leaked viral video opening of the film we come to see Gad's voice take the form of a young red retriever who escapes a fate at the pound and winds up in the arms of a young boy, Ethan (Bryce Gheisar), in 1961. Ethan is the son of a stay at home mom (Juliet Rylance) and traveling salesman (Luke Kirby) who are so one dimension they don't have character names beyond Ethan's Mom and Ethan's Dad. We see the shenanigans phase where the boy and his dog, who is named Bailey in this segment, get into all kinds of trouble before it develops into a case of teenage boy who takes his dog with everywhere. And I mean everywhere. As a teenager, Ethan (now played by K.J. Apa), is a star quarterback of his high school football team which is of course not good enough to earn the approval or respect of that aforementioned one note father. Kirby's Ethan's Dad is such a pessimist from the get-go it's hard to take him serious as much as it is not hard to see where this thing is going and yet it never builds to anything; this dramatic point that might have been used to solid effect is instead only a stepping stone for more outlandish actions that result in such obvious moments of melodrama that the film ends up pulling strings on either side of your mouth-forming a cheesy grin-rather than tugging on the heart strings as it is so obviously meant to do. In the midst of all this familial drama Ethan finds a girlfriend in Hannah (Britt Robertson) providing something of a respite from the predictable and instead allowing a quaint little love story to breathe. Things happen, life goes on, and people drift apart which in the case of A Dog's Purpose, mean puppies pass on and we move into a new life with new humans. Gad's all-seeing canine persona shifts from Bailey to that of a police K9 working with Officer Carlos (John Ortiz) to that of a Corgi whose owner is something of an introverted college student played with just enough charm by Kirby Howell-Baptiste that it isn't totally weird. These lives take us from the early sixties up through to the present day where the arc of Bailey, Ethan, and Hannah comes full circle. Ethan (Bryce Gheisar) and his mother (Juliet Rylance) find happiness in their new puppy, Bailey. © Universal Pictures /DreamWorks II Distribution Co., LLC and Walden Media, LLC. All Rights Reserved. The advantage A Dog's Purpose possesses as far as the whole thing feeling somewhat fresh and slightly unique is that it fully commits to seeing the world through the perspective of its dog protagonist even if it doesn't always play by its own rules-which is impossible, I realize. This alone may not even seem that original, but it is the small caveat of having the mindset of the dog be that of thinking all of the action the humans take has something to do with him that made it stand somewhat apart for this viewer. That somehow everything these people do or every choice they make is centered on the existence of this animal that, in reality, is lucky just to have found people that love him and give him as much attention as they do. In conveying this sense of importance and relevance in his/her lives to those of the humans around them it is Gad that is key. Throughout the film I couldn't help but to think what an odd choice Gad was for this role. Sure, he has a different enough pitch that it could convey both masculinity and femininity to an extent depending on the situation, but it is such a distinct voice and so associated with his Frozen character at this point that one can't help but wonder if it won't be a little distracting to many of the young viewers who fell in love with Anna, Elsa, and Olaf when they were a few years younger. This isn't what really matters though, but more the empathy Gad is able to elicit from the situations and the mindset the film gives its canine heroes. It's mostly cutesy, but there are enough light and funny moments spun from the whole "perspective of a dog" premise that enough chuckles are earned so as to equal the groans earned by the hokier moments. And that is essentially the critical issue the film encounters in that it is so unabashedly sentimental and yet never utilizes any such situations to genuinely play of the audience's emotion. Rather, it turns into a predictable, if not at least organized when it very well could have felt scattershot, tale about a boy and his dog and how that bond is never broken with a few vignettes chronicling the other kinds of lives dogs can have with non-white middle class people. It's only about half as refreshing as it sounds. The remainder of the film and the pleasures derived from it largely come from the appealing cast and the undeniable appeal of puppies and various dog breeds filmed in various stages adorableness. Hallström is seasoned enough to know what tone to set for this type of movie and in adapting W. Bruce Cameron's popular book series the director chooses to go the route of a Hallmark movie made more prestigious by the presence of credible talent. Most notably Dennis Quaid and Peggy Lipton who turn the final act of A Dog's Purpose into what makes the film worth investing one's time in at all. The movie, in its final act, is afforded the opportunity to be something a little more than that of the standard weepathon it is so obviously meant to be. Through the performances of Quaid and Lipton the passage of time the film chronicles is allowed more perspective and more weight as the two actors embody a lifetime of regret and complacency with the re-appearance of a factor from their formative years ultimately serving, if not a little more, as a reminder of what was once shared between the two. It is a sweet segment in a mostly endearing if not wholly sappy endeavor that dog lovers will enjoy if not adore and to which everyone else will be indifferent to. A Dog's Purpose isn't particularly good, but it isn't bad enough to be offensive in any way.